Tonight’s dinner? Leftover chili from last night’s Super Bowl feast. I had spent a lot of time mulling over the menu, and finally came up with a roster of impressive dishes to feed a small yet hungry party. No Super Bowl gathering is complete without dip, so I started things off with crudités served with onion & fresh herb dip. At the end of the first quarter, I skipped Buffalo wings in favor of drumsticks—roasted with a hickory spice rub I picked up in New Orleans. When it came time for Madonna’s performance at halftime, it was time for the main course: chili and skillet cornbread. After searching through my cookbooks and magazines for a good chili recipe, I found one in an old issue of Cooking Light: Three Bean Vegetarian Chili. I wasn’t cooking for vegetarians, but as chili recipes go this one was big on flavor, color and texture. The three beans (pinto, red kidney and cannellini) are accompanied by chopped tomatoes, roasted peppers, the usual onions & garlic, and a surprise ingredient—butternut squash. Odd, I thought—but its nutty sweetness really complements the added spices—cumin, paprika, and crushed red pepper. For liquid, you’ve got the juice from the tomatoes (assuming you use canned), and vegetable broth. I had made some from scratch earlier in the week, and the earthy undertones from the mushrooms and parsnip made the chili that much richer. 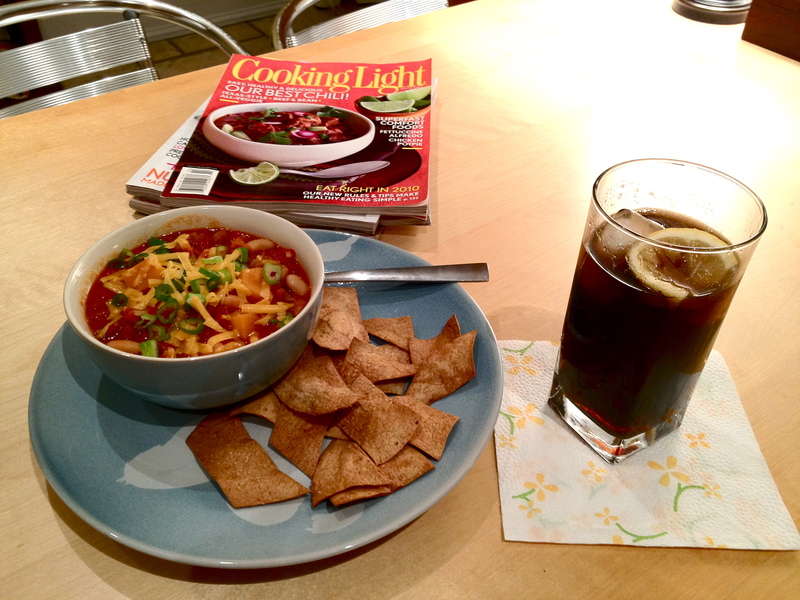 Cornbread is a perfect accompaniment to this chili (though the tortilla chips in the picture work well too). Skillet cornbread makes for a great presentation and a really moist, easy-to-cut bread. 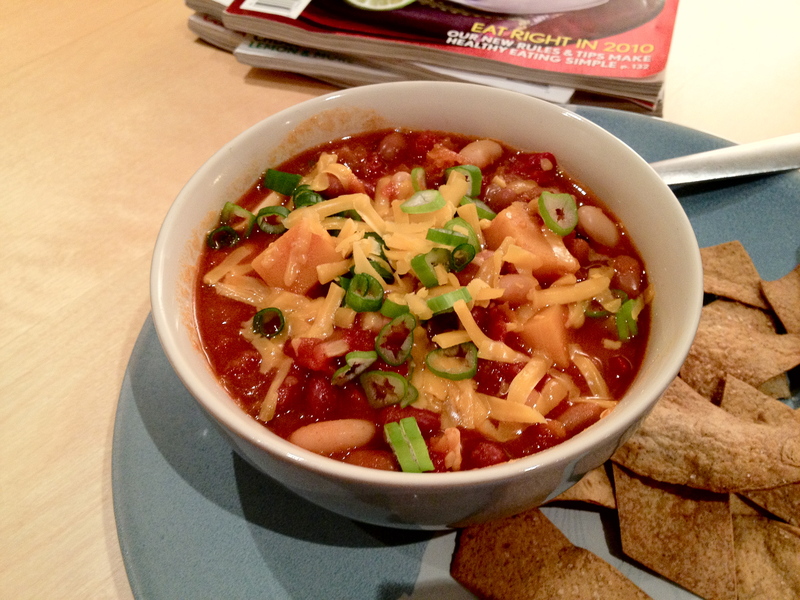 Garnish the chili with some chopped scallion & shredded cheddar, and you’re good to go. From prep to feeding time, the chili takes about 90 minutes to make. This recipe fed 2 very hungry Giants fans, 1 very annoyed and hungry Pats fan, and 1 hungry football fan who maintained neutrality through all four quarters. I had enough chili left over to make my boyfriend lunch & have a lovely dinner myself. Side note: For dessert, I made this pudding, a recipe I’ve been wanting to try for ages. Rich, decadent, creamy, spicy chocolate—enjoyed just in time to watch Big Blue win the game. This entry was posted in Recipes, Savory and tagged beans, butternut squash, cast iron, chili, cornbread, cumin, filling, healthy, hot, party food, peppers, photo, recipe, skillet, spicy, super bowl, vegetarian. Bookmark the permalink.